Oh my. Perfect composition. There is absolutely nothing in this image that I am not completely smitten with. 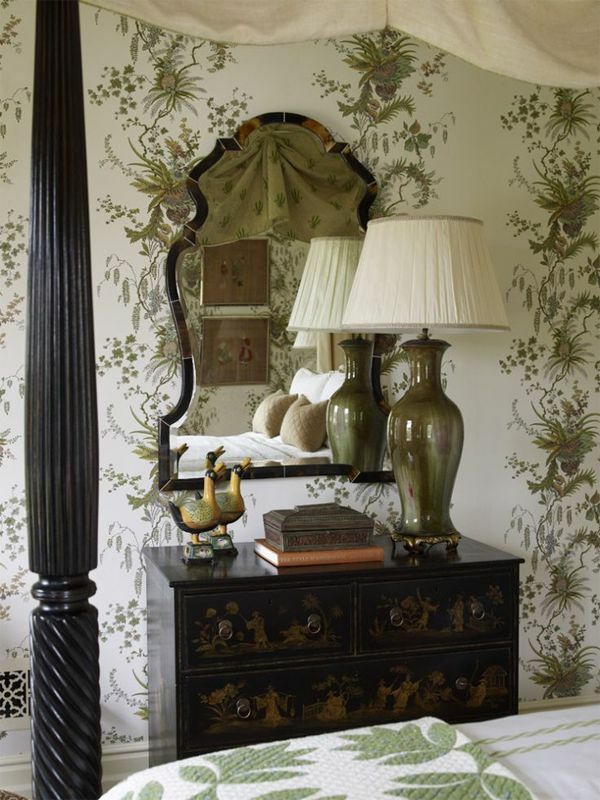 Such an elegant bedroom with a handsome, tailored color palette. The lamp with that wallpaper is serious business. And check out the reflection of the bed in the (to-die-for) mirror - crisp and simple. All you need when the rest of the room's accoutrements are so lovely. Even the vent cover is gorg. This is the time of year when everything starts to slow down a bit, and I'm not complaining. It feels like after Labor Day we are bouncing around straight through the holidays. But I feel like the crazy is finally starting to subside and we can have some quiet weekends at home with minimal plans and no traveling. C and I have the itch to get working on some small home projects that have been on our to-do list for years. Hope you have an enjoyable weekend...see you next week! Please, please please source that wallpaper!!!! Thank you. Great find! Love Alex's design style! Wonderful! The image is breath taking. I agree, source that wallpaper. Perfection!